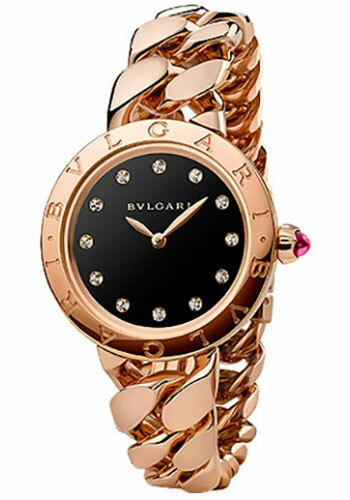 31 mm 18-ct pink gold case, 18-ct pink gold crown with a pink sapphire cabochon, engraved with Bulgari Bulgari logo bezel, sapphire crystal, black dial with 12 diamond hour markers, quartz movement, 18-ct pink gold bracelet, folding buckle. Water resistant to 100 ft.
31 mm 18-ct pink gold case set with diamonds, 18-ct pink gold crown set with a cabochon pink rubellite, diamond bezel, sapphire crystal, white mother of pearl dial with 12 diamond hour markers, quartz movement, 18-ct pink gold bracelet set with diamonds, folding buckle. Water resistant to 100 ft.
31 mm 18-ct pink gold case, 18-ct pink gold crown set with pink rubellite, sapphire crystal, white mother of pearl dial with 12 diamond hour markers, quartz movement, 18-ct pink gold bracelet set with diamonds, folding buckle. Water resistant to 100 ft.
31 mm 18-ct pink gold case, 18-ct pink gold crown set with pink rubellite, sapphire crystal, white mother of pearl dial with 12 diamond hour markers, quartz movement, 18-ct pink gold bracelet, folding buckle. Water resistant to 100 ft.
31 mm 18-ct pink gold case, 18-ct pink gold crown with black onyx cabochon, diamond bezel with 42 diamonds, sapphire crystal, black dial with 12 diamond hour markers, quartz movement, 18-ct pink gold bracelet with alternating diamond set and black onyx filled links, diamonds set 2 per link total 48, folding buckle. Water resistant to 100 ft.
31 mm 18-ct pink gold case set with diamonds, 18-ct pink gold crown with a coral, diamond bezel, sapphire crystal, coral dial with 12 diamond hour markers, quartz movement, 18-ct pink gold bracelet set with corals, folding buckle. Water resistant to 100 ft.
31 mm 18-ct pink gold case set with diamonds, 18-ct pink gold crown set with mother of pearl, diamond bezel, sapphire crystal, white mother of pearl dial with 12 diamond hour markers, quartz movement, 18-ct pink gold bracelet set with mother of pearl, folding buckle. Water resistant to 100 ft.